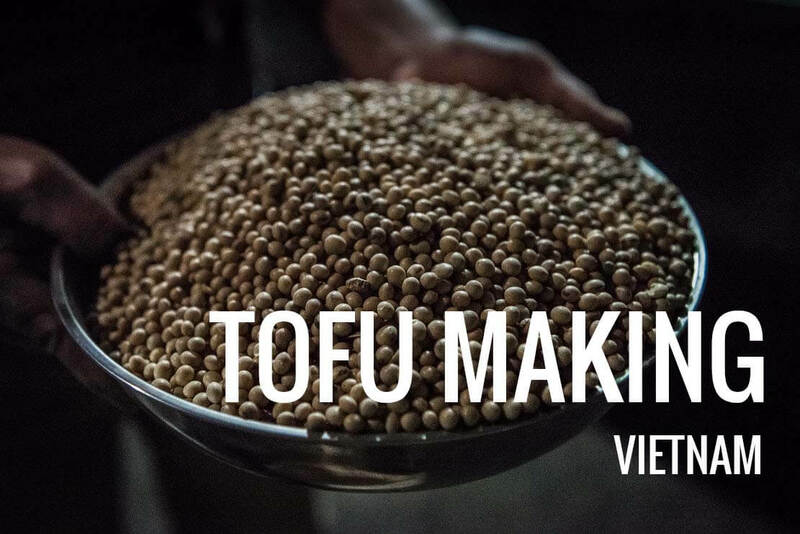 Processing soybeans into tofu is a bright invention, which has been performed by centuries. 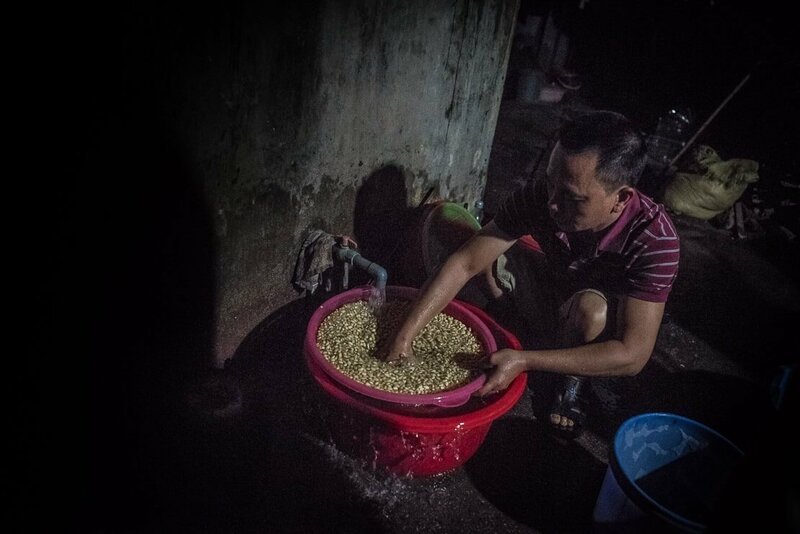 Making something so versatile, such as tofu, from hard and dried soybeans, requires patience and hard work. Many people see tofu as a tasteless meat substitute for vegetarians, who are lacking proteins. However, tofu is a very healthy and nutritious ingredient for making delicious dishes. With a low calorie count and large amounts of protein, tofu can be prepared in a variety of ways. 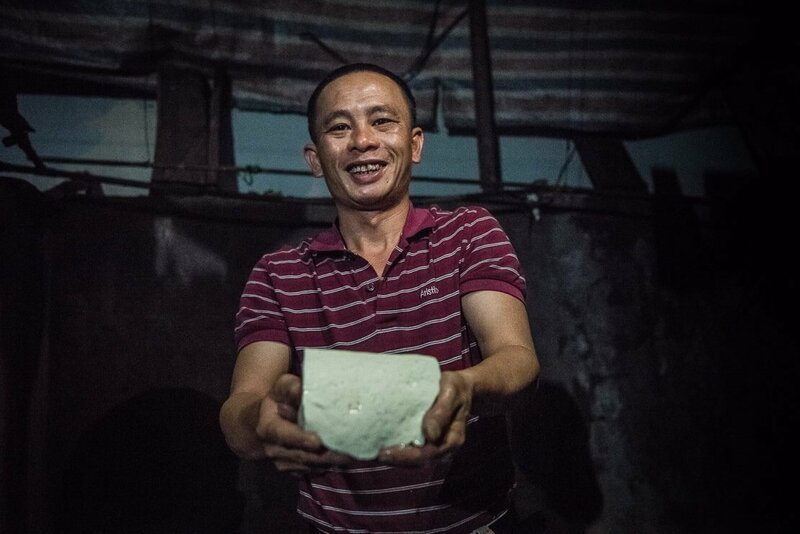 Tofu making was first recorded in Han dynasty China around 2,000 years ago. 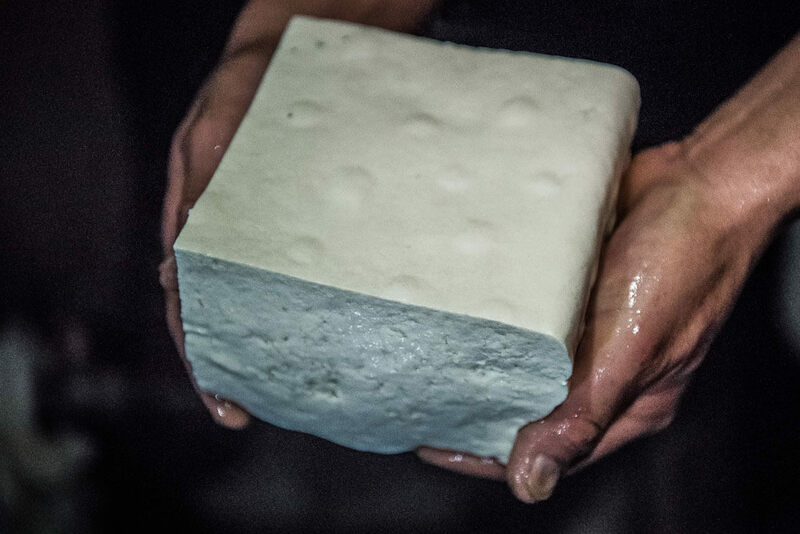 Tofu making technique has been later introduced into Korea and Japan. The Buddhist monks played an important role in the proliferation of tofu all over Asia, as tofu was an important source of protein for their vegetarian diet. It is believed that tofu has arrived to Vietnam in the 10th-11th century, and later has spread into other countries of South-East Asia. 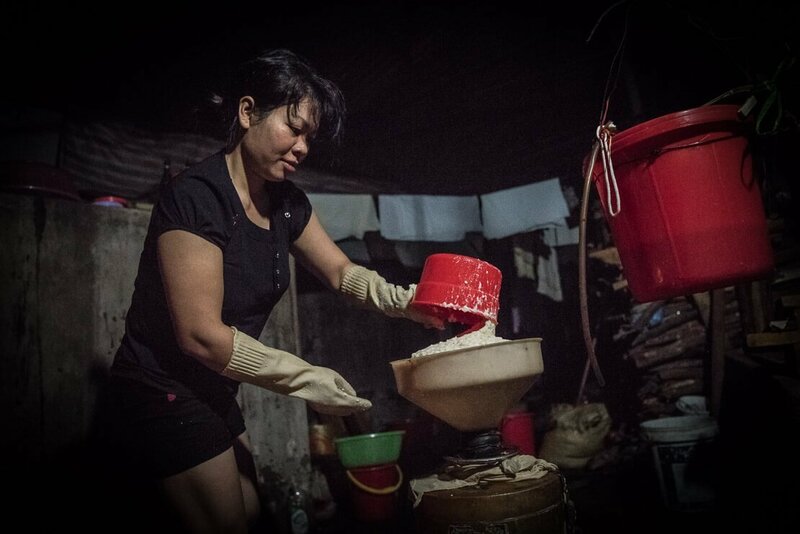 The Vietnamese don’t see tofu as a meat replacement for vegetarians, and many Vietnamese dishes combine tofu with meat to give more texture to the meal. 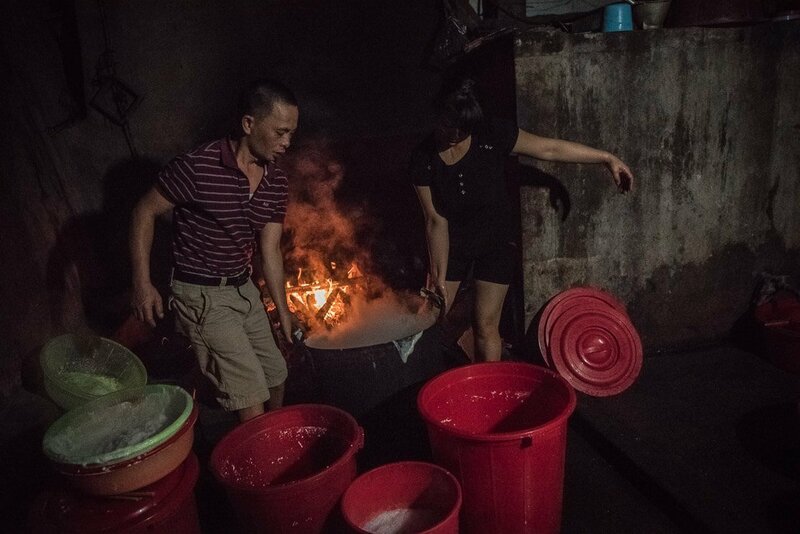 Tofu is found everywhere in Vietnam. It can be soft or firm, and it is prepared in a variety of ways – it can be fried, boiled or eaten raw. Tofu can also be the main dish such as bun dau, a popular street food. Bun dau comprises a plate of cold bun (thin rice) noodles, deep-fried tofu cubes, herbs and mam tom (fermented shrimp sauce). 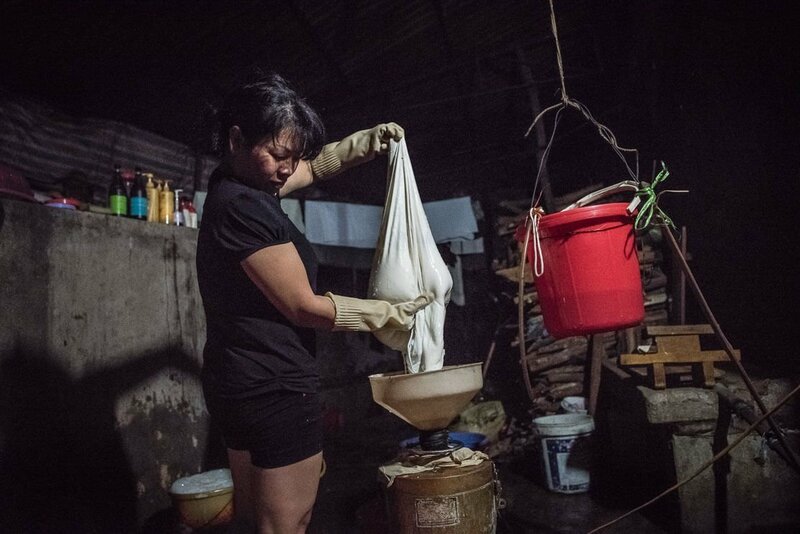 Bun dau is widely available in Vietnam and even without any sign, it can be easily found by the pungent smell of mam tom. 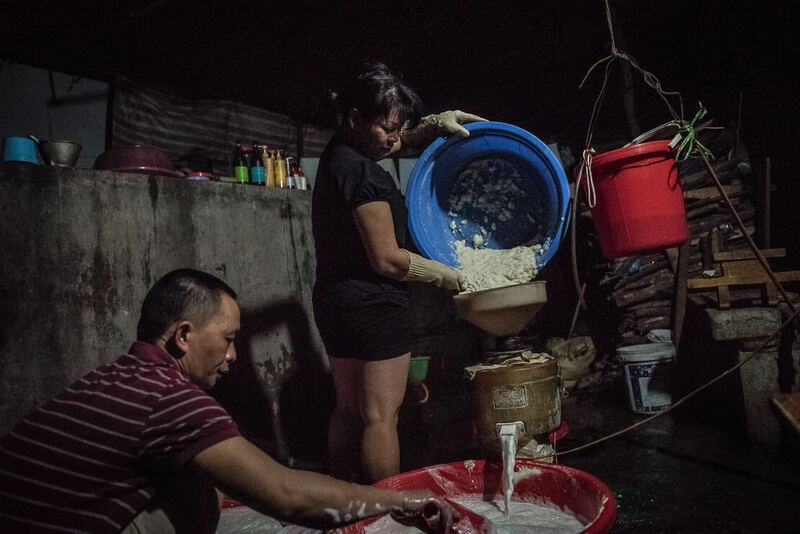 Eating a lot of tofu in Vietnam, we asked ourselves a question one day – how is it made? 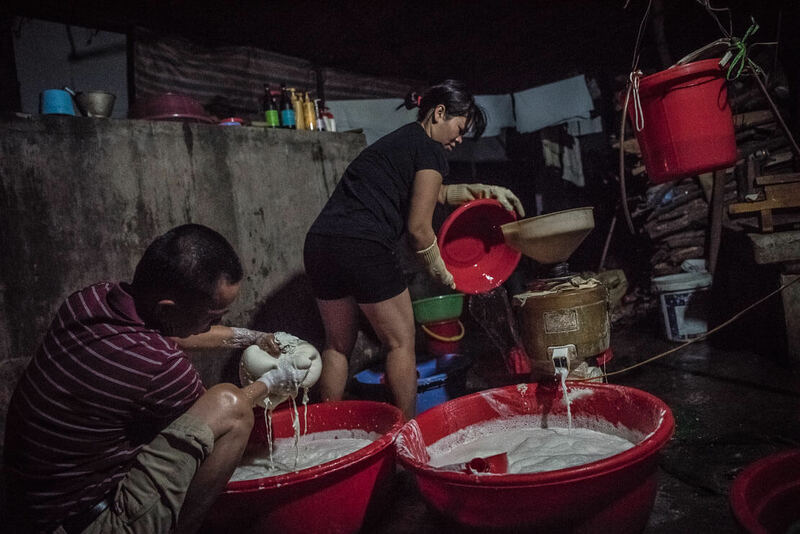 Tofu making starts very early in the morning so that it can be sold very fresh at the morning market. 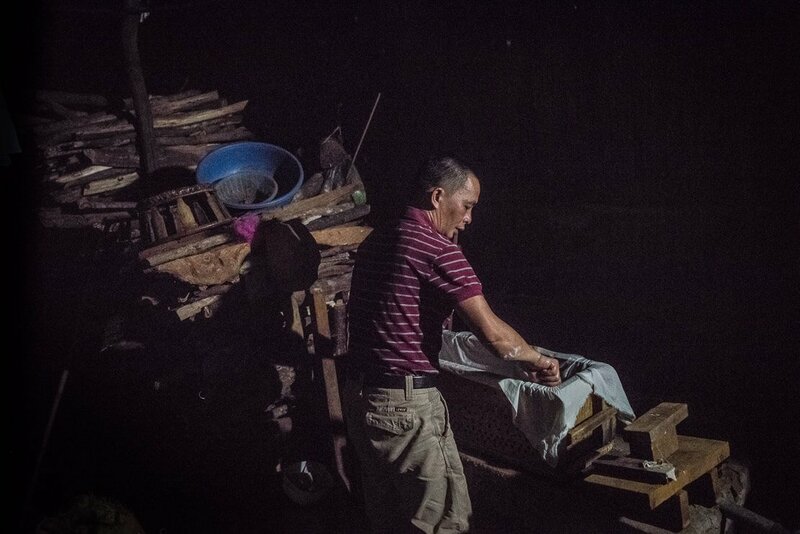 When we arrived at the family house in Mu Cang Chai at 4 am, the process has just started. 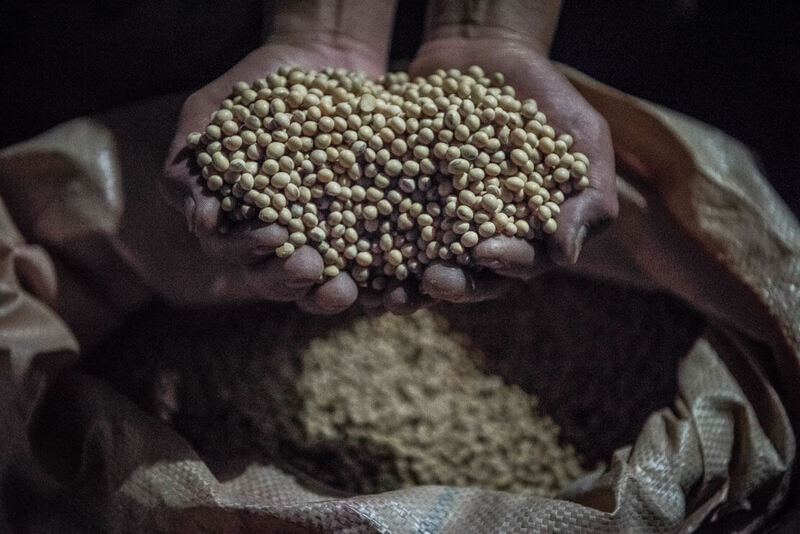 Processing soybeans into tofu is a bright invention, which has been performed by centuries. 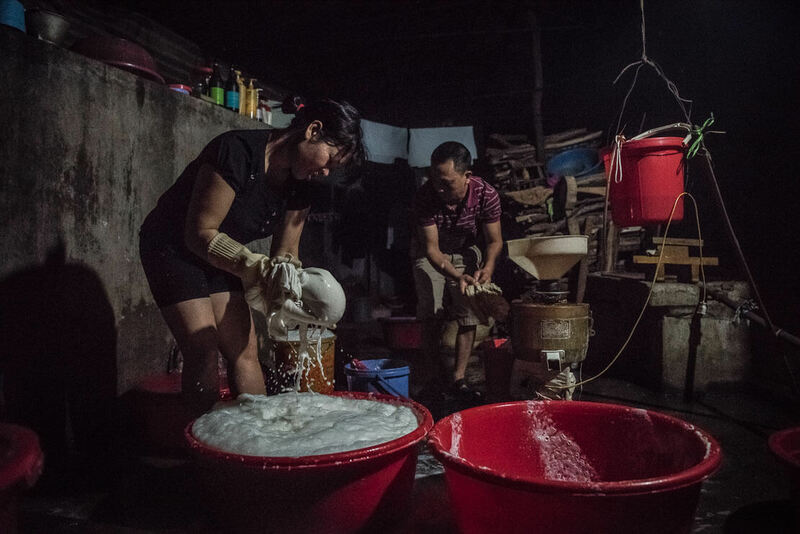 Making something so versatile, such as tofu, from hard and dried soybeans and water looks simple but it requires a lot of patience and hard work. The tofu making starts with the preparation of soymilk. 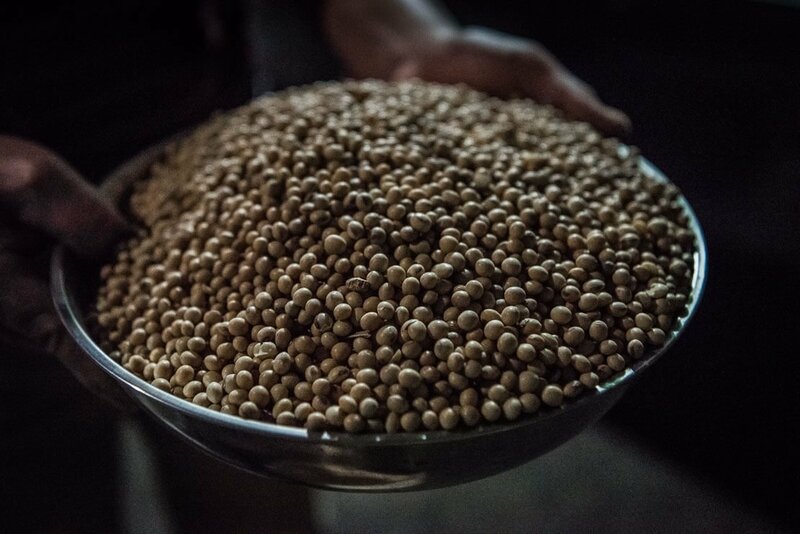 To soften the soybeans and get rid of the skin, the beans are soaked in water for several hours. The duration depends on the outside temperature. 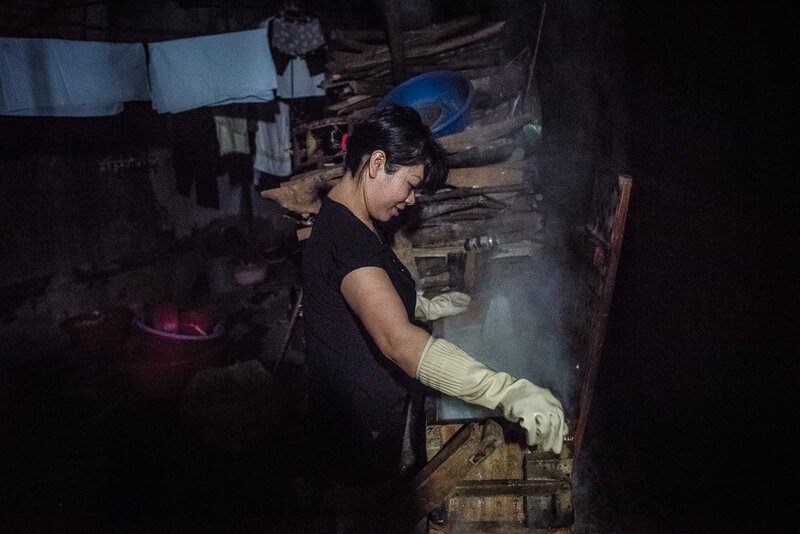 In the south of Vietnam with its hot weather it takes 2-3 hours but in the cooler climate of the northern Vietnam, especially in the winter, it may take several hours. The soaked soybeans are passed through the machine, which uses centrifugal force to separate water from the flour looking mass. This mass is then mixed with water and passed through the centrifuge again. The process is repeated three times. The white mass coming out of the centrifuge is filtered using a thin cloth and pressed by hand. 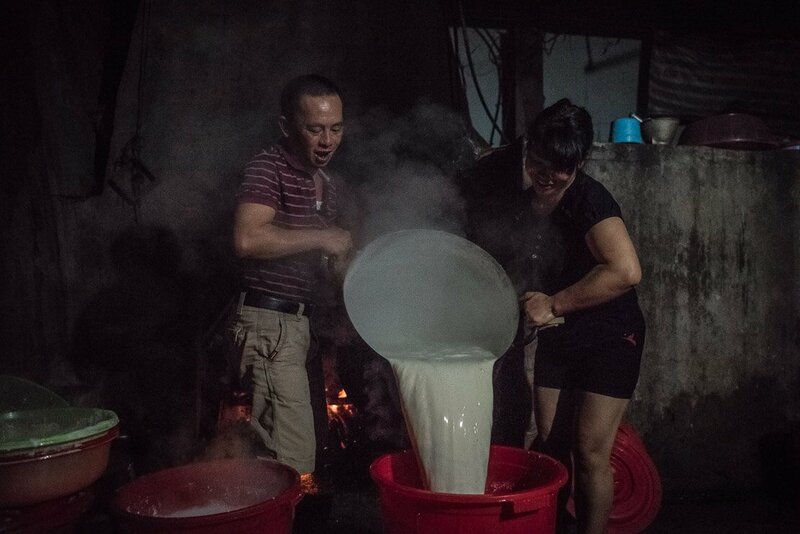 The resulting milky liquid is soymilk, and the solid rest is used as food for pigs. 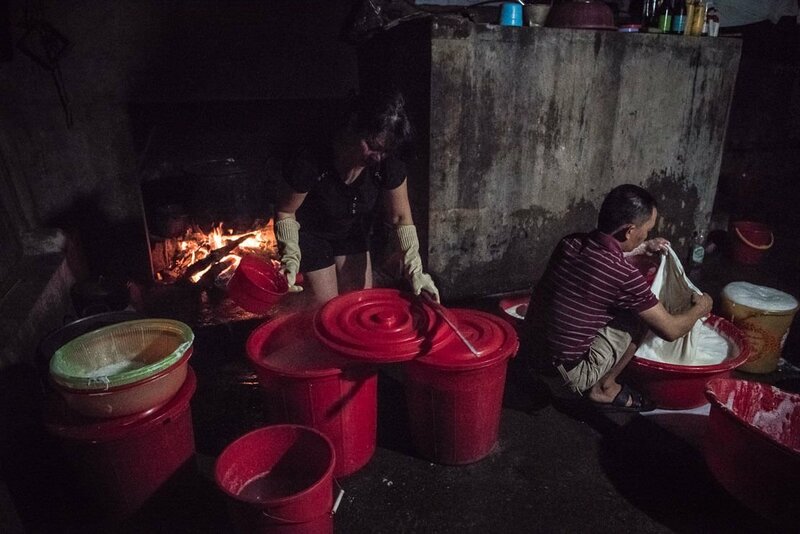 The tofu making process is heavily water consuming. The big basins of water hardly used during the whole process are emptied and refilled several times. 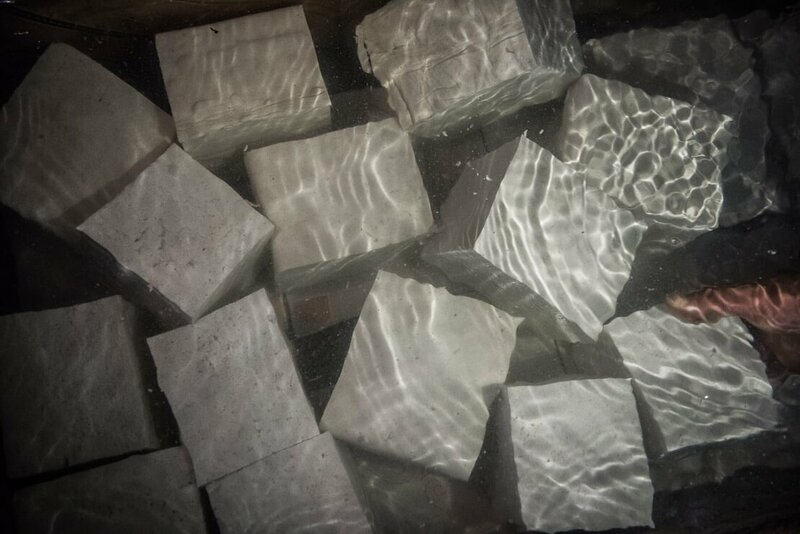 Hundreds of litters of water are easily used to make a few kilograms of tofu. 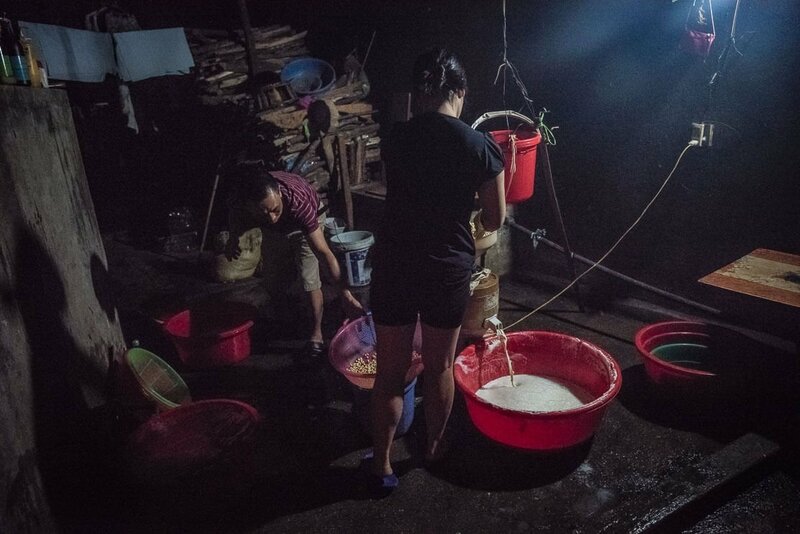 Luckily, water is abundant in the mountainous town of Mu Cang Chai. 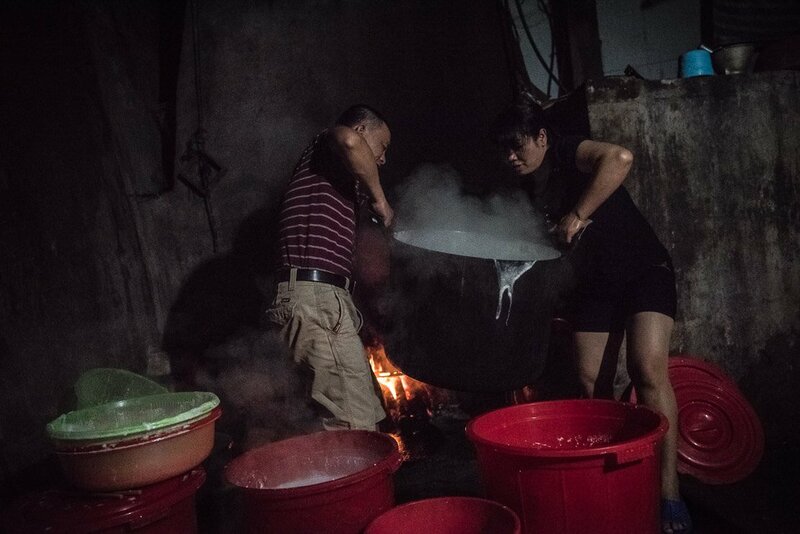 The soymilk is poured into a cauldron and heated for about 20 minutes on fire. 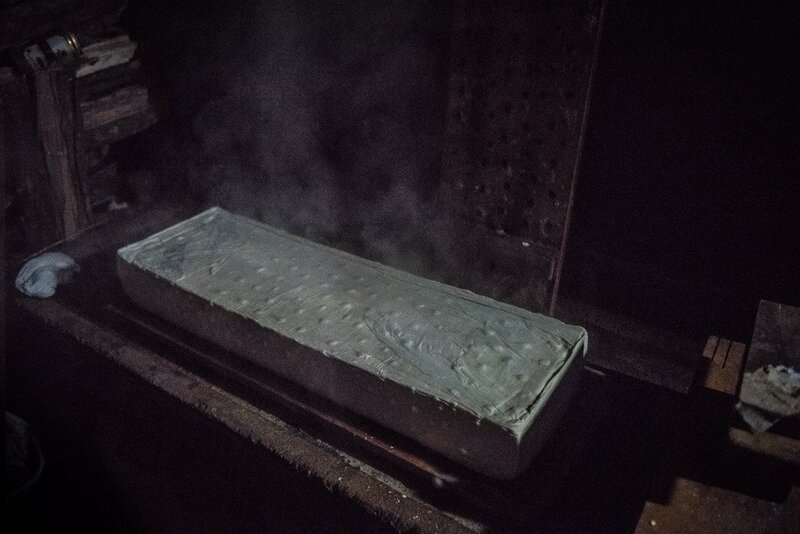 It is then poured into large plastic basins for cooling. Sometimes, a spoon of table salt and an acidic coagulant may be added to soymilk to give tofu more texture and easily separate the tofu curd from the yellowish soy whey. However, adding any coagulants is not really necessary as sour and acidic soy whey from a previous batch of tofu does a good job. If too much acidic soy whey is used, the tofu can be sour-tasting and hard. If too little is used, the tofu will be too soft. 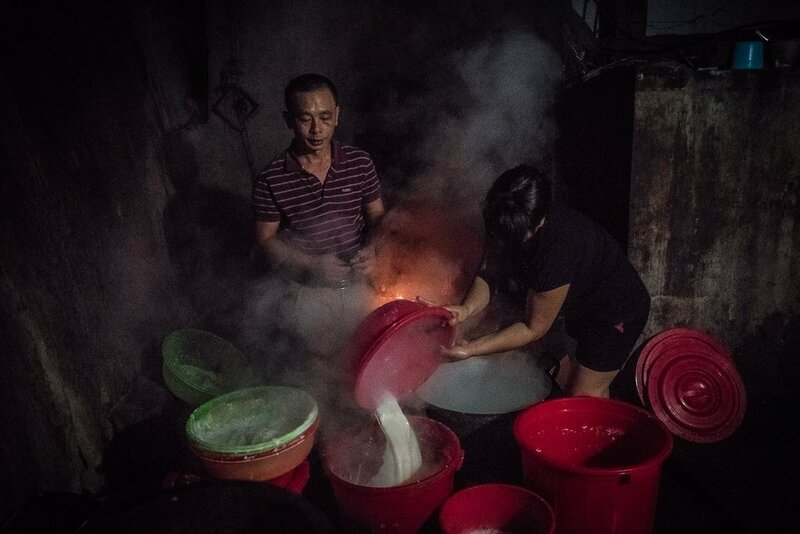 The tofu mixture is stirred in the cauldron until the texture becomes like a cottage cheese. 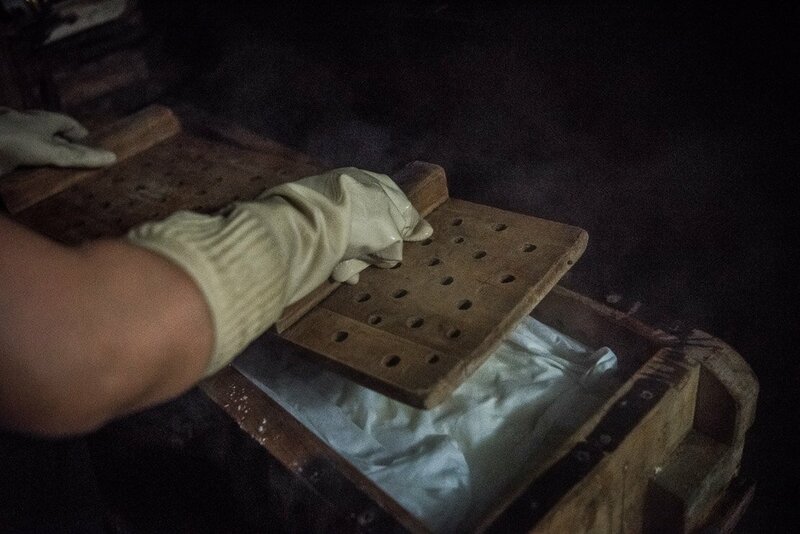 The final procedure requires this hot and still simmering mixture to be slowly poured into a wooden mould covered with a cloth. It’s put under the press and gently pressed to squeeze out any extra liquid. 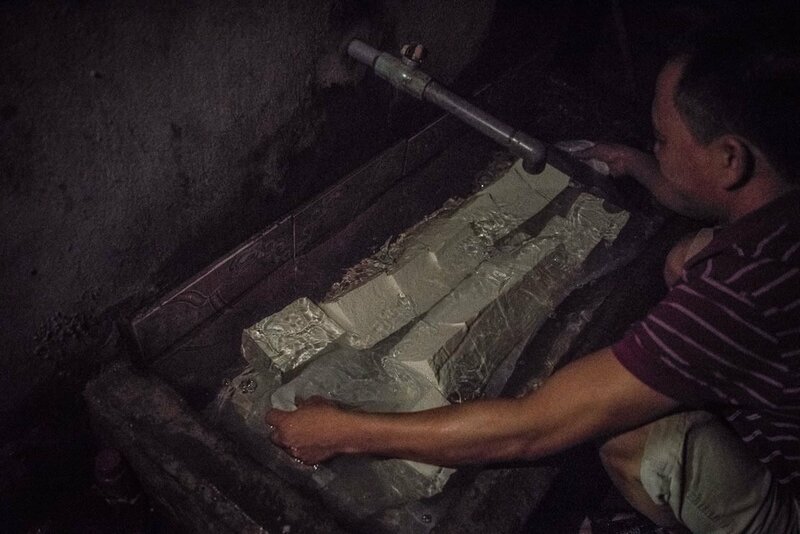 Around 15 minutes later, the tofu mixture becomes one big block, soft but not liquid anymore. 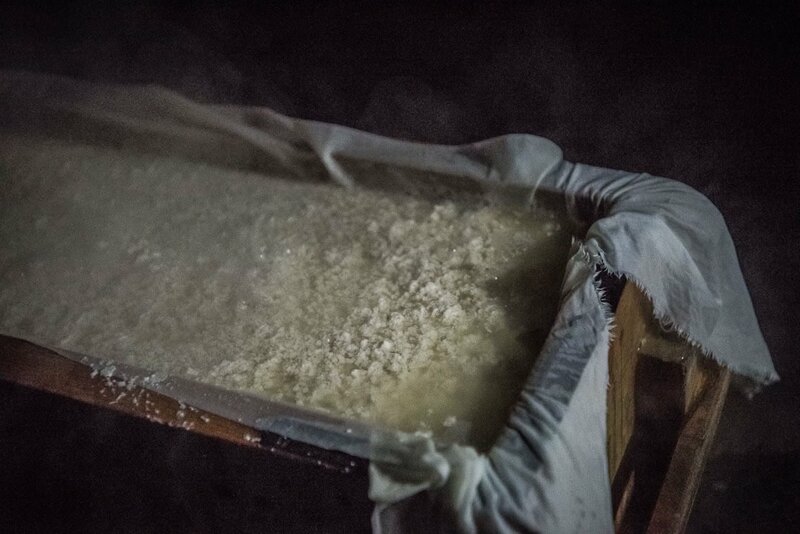 The block of tofu is unwrapped and placed, still hot, in the basin with cold water to cool it down and preserve. The tofu is then cut into smaller blocks. Tofu is ready and is now waiting for the shop to open and for being sold. 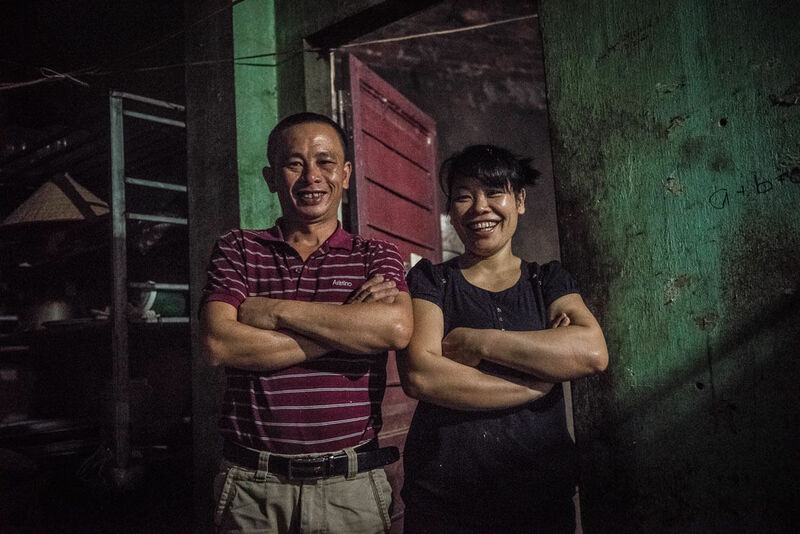 We are very grateful to the family we stayed with in Mu Cang Chai, for arranging this visit for us. Observing the local family making tofu, we witnessed an interesting technique, which from now on gives another dimension to tofu in our plate.